Cars 5, 6, 7, 19, 20, 21, 22 are fitted with air connections for use with Winter Trailers 57/58. However the air brake equipment was surprisingly removed from Winter Trailer 57 during the last major overhaul during 2002. Car 9 was fitted with Illuminations in 1993 for the MER Centenary , some of which it retains today. Car 22 was destroyed by fire in Sept 1990. 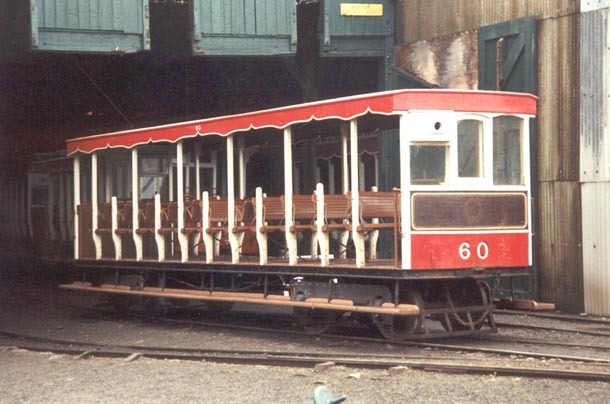 The rebuilt Car 22 with bodywork by McArds of Port Erin returned to service in 1992. Car 25 was stripped of trucks and motors 2003 for fitting to the 'new' dedicated MER works car, now known as 34, but previously was the replica of Snaefell Mountain Railway car 7 'MARIA'. Car 27 was coverted into a dedicated works car during the 1990's but has since been withdrawn. Cars 14, 15, 17, 28, 29 are stored unserviceable at the former Homefield Bus Works, Douglas. Cars 18, 25, 27, 30, 31 are currently stored unserviceable on the Manx Electric. Trailer 45 lost its body during the winter 2003/2004 and was converted into a flat per way wagon. Trailer 51 was rebuilt to its 1894 condition in 1987. Trailer 52 was used with roof and seats removed as a bogie flat wagon each Winter for many years, but reassembled for seasonal use. With the general availability of trailer 59 for service purposes after 1940 , trailer 52 was no longer needed to make up the total of 25 trailers and became permanently allocated to engineering duties. Trailer 55 is currently stored unserviceable on the Manx Electric. Trailer 56 rebuilt 1994/95 as a saloon and fitted with sides, glazing, wheelchair hoist, dynamo and demountable seating as a disabled access car. For full details of the MER Fleet see Manx Electric by A.M. Goodwyn.